This reading passage for kindergarten is a riddle. What is funny about this cow? Can you figure it out? Can the kids figure it out? Can you come up with the answer by looking at the picture, before even reading the passage? There are three worksheets included – a color version, a black and whit version, and an answer sheet. 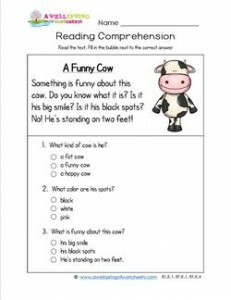 Please go to this page to see all the Reading for Kindergarten worksheets in this set.